Our extensive range of high quality pictures of other Elizabethan theatres can be accessed via the Elizabethan Theatre section these include a picture of the Fortune Theatre, Bell Savage picture, White Hart, the Cockpit picture, the Bear Ring picture and many more together with various pictures of inn-yards and other theaters. The Globe was built 1597 -1598 and owned by Richard Burbage. The old Globe was a magnificent amphitheatre, as shown in the picture at the top of the page. 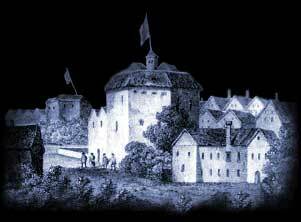 Sources for such pictures are extremely scarce but although little of the Elizabethan theatres survive, there are some facts which can be deduced about their appearance. Most common are the illustrated maps that were popular during the Tudor era which clearly show the outlines of theatres. These map views together with the valuable contribution of the diary and visual record of the Swan Theatre by Johannes de Witt help us to form a picture of the first Globe theater. Maps of London clearly show the architecture of the buildings, and these have enabled an approximate picture of the old theatre, such as the example picture at the top of the page, to be drawn. Inside picture of the old Globe theatre - none exist! The Globe was only in use until 1613, when on June 29 a fire broke out at the theatre when a canon was fired during a performance of Henry VIII catching the roof on fire and the building burned to the ground. In 1614 Theatre was rebuilt . In 1644 it was demolished by the Puritans. For full details of the history please click the appropriate link. A Timeline is also available clarifying the key dates in Old Globe Theatre History & Timeline. The site of the Shakespearean theatre was rediscovered in the 20th century and a reconstruction of Theatre has been built near the spot. The following section features an unusual picture of the stage and a Timeline charting the building.